FULL DISCLOSURE: I made a donation to the Acumen Fund to get an advance copy of this book. FULLER DISCLOSURE: I would have donated twice as much to get it that much sooner because it's that powerful. This is not a marketing book, though few of Seth's last books really felt that way. This is a book about becoming indispensable, about becoming a linchpin. However, reading the book is not like reading the map; read the book and become a linchpin-in-training. In thinking about it, especially because such a large portion of the book is dedicated to gifts, this books is really Godin's gift to anyone that is willing to read, to question themselves, to take the steps to become a linchpin-in-training. As I read through the book, constantly highlighting and dog earring pages, it became clear to me that Godin didn't have to share the information in the book -- he certainly didn't need to share everything in the book. Of course, had he left out any bit of information that he included, then he wouldn't have been practicing what he preached; he wouldn't have given away all of the knowledge that can help you succeed with no expectation of financial gain (sure, he'll make some money from the price of the book and maybe get some speaking engagements, but he could have provided so much less and still had the same outcomes, which makes the book itself a perfect example of the content of the book). You might be surprised to hear that you'll learn a lot about yourself when reading this book, provided you can beat down the resistance that you may have to doing so. I'll admit that I raced through the book the first time I read it, underlining good quotes and points, but not really applying the knowledge to myself, not engaging the introspection that I should have. So I read it again. Because the resistance was to write a review quickly (which I could have) and not absorb and live the information -- I pushed against the resistance and did it the "hard" way, which ultimately was the more valuable way. Ultimately this book is about helping you discover the artist that's already inside of you, to create art. As Godin defines it: "Art is a personal gift that changes the recipient. Art is a personal act of courage, something one human does that creates change in the other." This books makes you think about all the ways you can become great at creating art; linchpins, ultimately are artists. If you're looking for the map on how to do all this stuff, how to be an artist, then, as Godin says: "Here's the truth that you have to wrestle with: the reason that art (writing, engaging, leading, all of it) is valuable is precisely why I can't tell you how to do it. If there were a map, there'd be no art, because art is the act of navigating without a map." 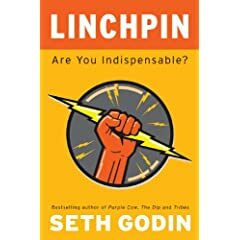 Linchpin will be available on January 26 and presumably will be available in a Kindle version (it will likely show up on Amazon's Kindle site the day of the release). PS -- my ship date for this review was the end of the day today (January 18): review shipped on time (even though it's not necessarily perfect, I'm done thrashing it). PPS -- if during reading (or even before reading) you want to give up (or not start), look on page 101 of the hardcopy version; don't be at the confluence. Can't say that I disagree, but I'm a self-admitted fan of most of the products.